In the new edition of his ground-breaking book, Jackson demonstrates that building a ‘post-growth’ economy is a definable and meaningful task. Starting from clear first principles, he sets out the dimensions of that task: the nature of enterprise; the quality of our working lives; the structure of investment; the role of the money supply. He shows how the economy of tomorrow may be transformed in ways that protect employment, facilitate social investment, reduce inequality and deliver both ecological and financial stability. Prosperity isn’t just about earning more and having more, it is anchored in our ability to participate meaningfully in the life of society. Citation: Jackson, Tim. Prosperity Without Growth: Foundations for the Economy of Tomorrow, 2nd Edition. Abingdon, Oxon; New York, NY: Routledge, 2017. 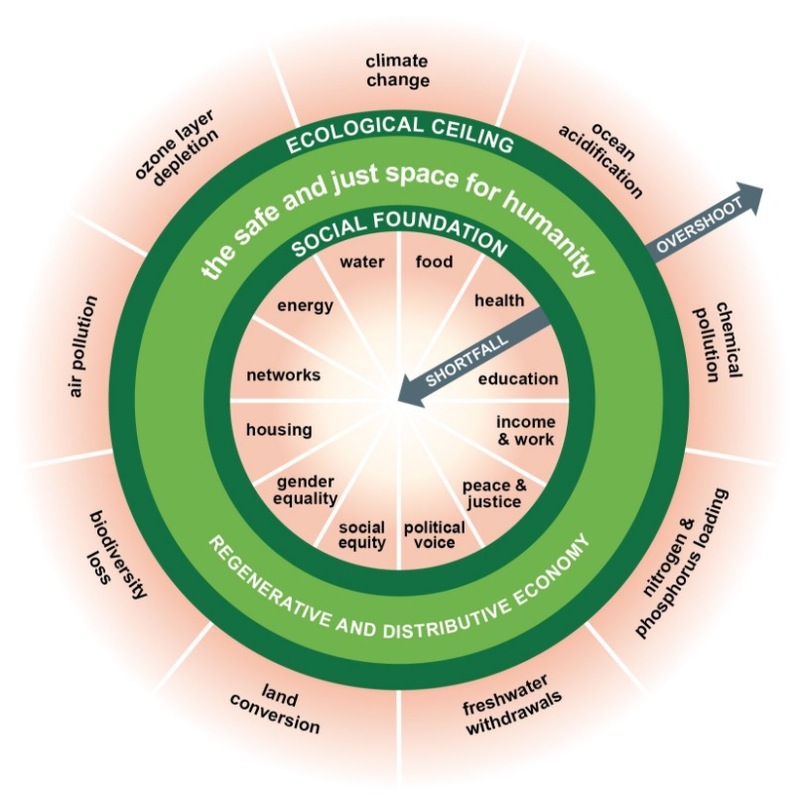 In her book Doughnut Economics: Seven Ways to Think Like a 21-Century Economist, economist Kate Raworth illustrates the shortfalls of existing economics and introduces the "doughnut" model. Bounded by both planetary resource limits and meeting basic human needs, the doughnut represents a safe and just space for humanity. Her challenge to economists: "to ensure that no one falls short on life’s essentials (from food and housing to healthcare and political voice), while ensuring that collectively we do not overshoot our pressure on Earth’s life-supporting systems, on which we fundamentally depend – such as a stable climate, fertile soils, and a protective ozone layer." Citation: Raworth, Kate. Doughnut Economics: Seven Ways to Think Like a 21-Century Economist. White River Junction, VT: Chelsea Green Publishing, 2017. Ten years after the publication of the first edition of this influential book, the evidence is even stronger that human economies are overwhelming the regenerative capacity of the planet. This book explains why long-term economic growth is infeasible, and why, especially in advanced economies, it is also undesirable. Simulations based on real data show that managing without growth is a better alternative. Citation: Victor, Peter A. Managing without Growth: Slower by Design not Disaster, 2nd Edition. Cheltenham, Gloucestershire; Northhampton, MA: Edward Elgar Publishing, 2019. Green Economy at Community Scale is one of the first research-based explorations of the green economy at the local level. Professors Tim Jackson and Peter Victor — two of the world’s top ecological economists and leading thinkers on issues of environmental sustainability and economic growth - lay out a blueprint for local economies that calls for rethinking work and productivity, and developing a new vision of enterprise, investment, and a money economy that can support a shared and lasting prosperity. A web-based resource from the UK's Centre for the Understanding Sustainable Prosperity (CUSP) features new research, events, news and a blog exploring the many dimensions of sustainable prosperity. The CUSP research program is organized around five key themes: meanings and moral framings, arts and culture, politics and institutions, social and psychological understandings and system dynamics. Halina Brown discusses how America became a consumer society, where mass acquisition and use of material goods is the dominant lifestyle, the centerpiece of social practices, leisure time and cultural rituals. How can we reduce the ecological impact of these lifestyles while fostering economic well-being? As the world faces recession, climate change, inequity and more, Tim Jackson delivers a compelling challenge to established economic principles, explaining how we might stop feeding the crises and start investing in our future. A funny yet compelling illustration of the limits to economic growth.